"cinematic love stories don't come more convincing or singular than this." 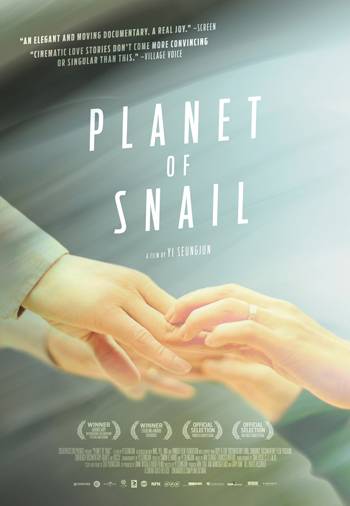 A wondrous documentary that's been winning over audiences around the world, Planet of Snail is a journey into the life of a most extraordinary couple. Young-Chan is an accomplished poet who can no longer hear or see. He communicates with his wife Soon-Ho through finger braille, a unique form of communication where words are tapped on each other's hands. They rely on one another completely; even simple domestic tasks require complex collaboration and everyday moments that most of us hardly notice become tender shared experiences. Combining breathtaking imagery with Young-Chan's personal writings, Planet of Snail becomes a transfixing portrait of life on what seems like another planet, where touch communicates everything and love conquers all.